I think that there are two vital requirements in order for us to learn something: obtaining information, and understanding information. Both elements are necessary. Something can’t be learned if new information is not available, and learning is not real if there is no understanding is not reached. Given that both elements are necessary, various aspects of HE can be examined to determine if learning is happening. I will focus on one element here in this post today. Anyone who has read my blog in the past will know that I don’t think highly of lecturing as a form of teaching. Lecturing is about transmitting information in a verbal format. It is the presentation of information, in a (hopefully) clear and logical fashion to a learner. Although many lecturers claim otherwise, this is what lecturing is – the transmission of information. I have no argument with the idea that there are good and poor examples of lecturing. I have been exposed to both. I have listened to well presented and interesting lectures, and I have listened to abysmal lectures that shouldn’t have been delivered. However, regardless of the quality of the lecture itself, a lecture is basically about transmitting information. That is all the lecturer has control over – the delivery or transmission of the content or information. 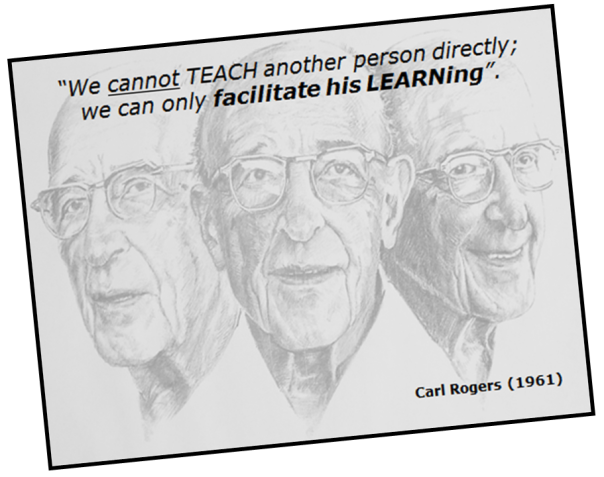 The understanding component is what the learner has to do. Many lecturers tell me that in their lecturers they deliver understanding – but they are simply wrong. Understanding is an active process that involves thinking and incorporating information into an already constructed worldview. This is an internalised process that is individualised by a learner. It can be supported and fostered by a good teacher, but requires active engagement by a learner before it can take place. A lecture, by its very nature, is a one way communication where the learner is the passive recipient of the information that the lecturer is transmitting. The very design of a lecture theatre is to focus attention on the lecturer, and discourage discussion between learners and each other, or learners and the lecturer. Most lecturers would like to have interaction and discussion during a lecture, but the failure rate for this aspiration is high (maybe failure is to harsh, but few of us would get above a C-). Given that we live in (or are mostly in) the age of information abundance, why do we see ourselves as vital in the process of transmitting information to learners? Why is lecturing synonymous with teaching in HE? Even within the lecture theatres that we use to transmit information, wifi means that the information that we are transmitting is in the very air around our learners – and I am frequently asked if we can get access to wifi blocked in a lecture so that the students will pay attention to the lecturer. Given that we live in a world of mass higher education, and that our availability to our learners is seriously limited by time and numbers, why do we insist on spending what little time we have on information transmission. This aspect of learning can be better accomplished a number of ways, including reading, listening to recorded information, or viewing video – none of which take up our precious time and energy, which could be devoted instead to fostering understanding. I know that fostering understanding is a much more difficult task than transmitting information, and I think that is a part of the reason why we don’t devote ourselves to that aspect of learning. We have done our jobs if we transmit. 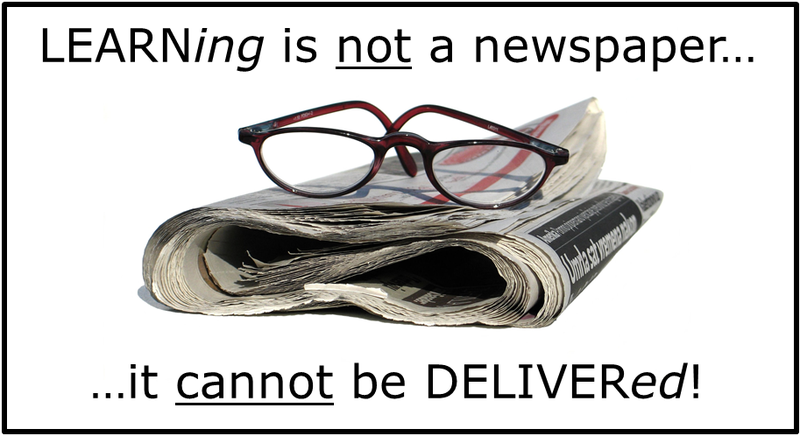 It is the learners job to incorporate and understand the information we have transmitted. I have spoken and it is up to my students to learn. We can do better than that. With all the flack thrown at the Khan Academy, the idea of a flipped classroom where the teachers role is to foster understanding has got to be better than the current situation where HE teachers see their primary function as information transmitters. Just as the old photocopy notice “To copy is not to learn” is applicable to students, I think that the notice “To speak is not to teach” is just as true.